As a young boy my mother would allow me to sit in the downtown cathedral as she did her shopping. It was a marvelous and mysterious place, a place of wonderment. As I sat quietly in the pews before various side altars I was not alone. Here and there scattered in their strategic locations were the Babushkas. I can still remember their large fingers, worn with years of scrubbing, peeling, washing, mending and, ...and praying. Hands holding beads that somehow held them. 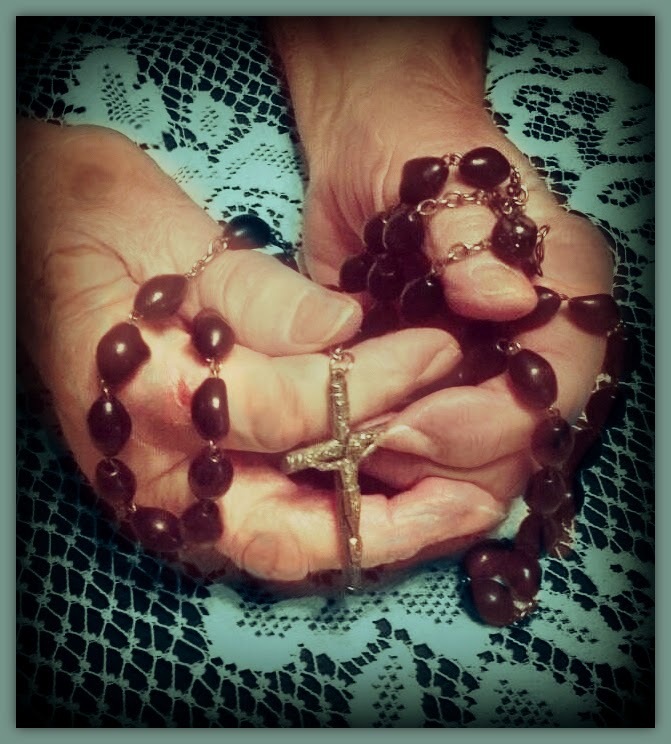 In remembering the Babushkas of my youth with their Rosaries, I’ve not since seen such resignation on a collective level. These old ones had lived in unsolvable situations, resigned to God’s will in a mutual gentleness, a kind of communal mentality of quiet martyrdom. Their genuine anguish, their suffering, their sameness, day in and day out, without any hope for something better, muted any apocalyptic hope amongst themselves. They sat in silent seclusion, their eyes, as with their beads, turned inward to places of memory where everything and nothing had happened. Looking back upon a life that must have had more than its share of pain and inner torment they knew the days remaining to them were not enough to turn anything around. These things were unsaid, but if you would have been able to probe, to ask; if you would have been able to gain their confidence, they might have, in a very small, hesitant and untrusting way told you about them. They would have spoke with resignation and sorrow- not so much about themselves as individuals, but about others. The emotion was one of sorrow, not of anger and very rarely was it an impulse leading to some “strategy” as to what they could possible do about the suffering of others let alone their own. They would never have permitted their Rosaries to be enlisted to create or promote campaigns and causes. Theirs was the quiet entrustment of all to their beads as it had been throughout their lives, the one thing that had always been there, absorbing the pain, the hopelessness for anything better. These Babushkas believed that great suffering, everyday, mundane suffering is the place where the Kingdom of God settles upon the earth, that the cross on their beads was and is the axis around which the Kingdom turns. It is the Cross of Jesus on which He was announced King (John 19:19). 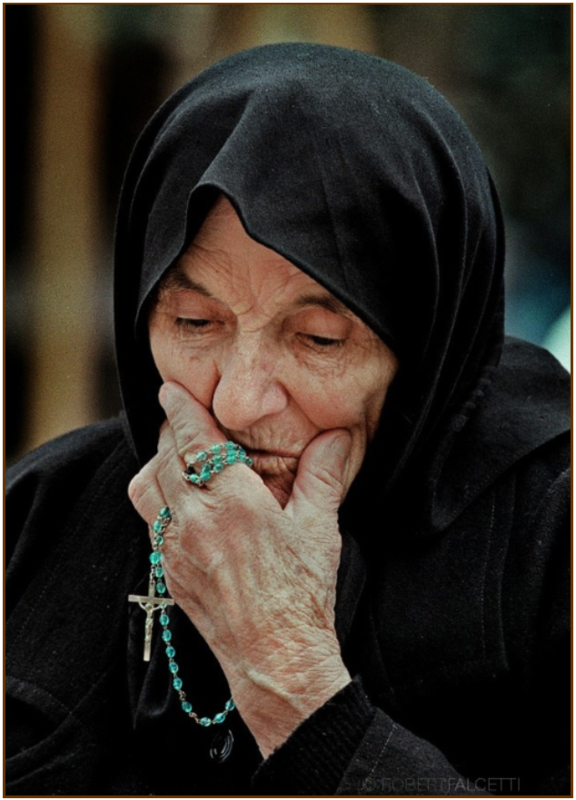 It will be people, like the Babushkas, who are willing to embrace the Cross personally and communally (Mk. 8:34-35; Mt. 18:20; Jn. 19:25-27) around and in whom the Kingdom will one day unfold. They are the ones who, in quiet resigned suffering, hold their beads, the place where the Kingdom of God will and is being built upon earth. I remember these old ones sitting before a statue of Mary, a silent statue honoring those who cannot speak, who have no one to hear them, thus making their beads, a place of conversation, a place where they could be heard. These Babushkas reflected Mary in their beads as the still, quiet place in the middle of the Church from which prayers were spoken and from which prayers were heard. I see her (Mary), as I did so many years ago as the secret, silent center of the old ones who needed no one to know what they were entrusting to their beads and what their beads were entrusting to them. They were making space for woundedness. I miss these hidden dear ante-deluvian saints of my youth. I cannot help but hope there are some left here and there doing what they always did with their beads, making possible the ongoing existence of the world because they were being “held by that which they were holding” - (Phil. 3:12, trans. Seraphim). Look for Part 2 of this post next week. But ah, ye keep my secrets well!